Companies can make brilliant moves, but there are also times when things don't work out quite as planned. From a book lover's tablet continuing to fade in the marketplace to a strong year for satellite radio, here's a rundown of the week's best and worst in the business world. Barnes & Noble (BKS) has seen the popularity of its Nook line of e-readers and tablets fade in recent quarters, but things have never slipped so sharply as they did during the holiday season. The bookseller is reporting a 60.5 percent plunge in Nook sales for the nine weeks ending Dec. 28. In short, there weren't a lot of Nooks in Santa's sleigh this year. The news is grim on the hardware end with devices and accessories off a steep 66.7 percent, but even digital sales fell a disappointing 27.3 percent. 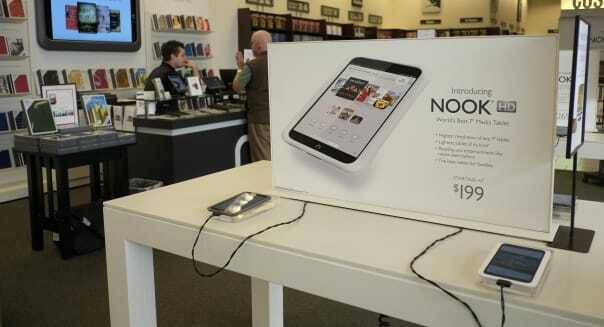 The Nook was supposed to be Barnes & Noble's catalyst for growth in a future in which consumers have tired of hardcovers and paperbacks. But now it's making up just 11 percent of the superstore chain's sales -- and falling fast. Something tells me there won't be a storybook ending for the Nook. Sirius XM Radio began the week moving higher after receiving an offer over the weekend to be acquired by majority investor Liberty Media (LMCA). It wasn't much of a premium, but that's what can happen when a company owns more than 51 percent of another. Then the satellite radio provider announced that it closed out 2013 with a better than expected 25.56 million subscribers. Sirius XM's previous outlook was to close out the year with 1.6 million net additions. It wound up adding 1.66 million net subscribers in 2013. There are many opinions out there on the winners and losers during this week's CES expo as consumer tech companies introduce their latest gadgetry, but it's hard to beat Samsung's presentation where Hollywood director Michael Bay abandoned the stage when the teleprompter stopped working. %VIRTUAL-article-sponsoredlinks%"I'll just wing this," he said on stage, but a few seconds later he panicked and walked off the stage. Samsung was hoping that Bay -- the maker of some of Hollywood's most explosive action movies -- would help show off Samsung's new 4K Ultra HDTV with a curved screen. It turns out that it was Bay himself that blew up on stage. Tech companies in the Bay Area have come under fire for pushing local real estate prices higher, but Google is doing its part to make sure that employees can find more affordable digs away from its Mountain View headquarters. Google began offering a free ferry boat service that will transport employees from San Francisco to Redwood City where a bus shuttle takes them to the company. The 67-minute ferry ride is long, but at least the traffic is predictable. Once again, Google is making other employers envious. If you don't have anything nice to say, don't say anything at all. That may have been sound advice from your parents, but sometimes silence isn't the best route to take when you're a public company. Shares of J.C. Penney stumbled on Wednesday after offering up a holiday update that was surprisingly weak when it came to actual performance metrics. "The company is pleased with its performance for the holiday period, showing continued progress in its turnaround efforts," it proclaimed, but never actually spelled out its performance for the month of December. It was boasting about a 10.1 percent increase in same-store sales for November a month earlier, and investors took the lack of detail as a troubling sign. J.C. Penney was one of last year's biggest losers with its stock shedding more than half of its value. It's off to another bad start in 2014. Motley Fool contributor Rick Munarriz has no position in any stocks mentioned. The Motley Fool recommends Google. The Motley Fool owns shares of Barnes & Noble, Google, Liberty Media., and Sirius XM Radio. Try any of our newsletter services free for 30 days.